I have to admit I have a weak spot for silk. This weak spot could have grown as a child, with the thought that silk was an ultimate luxury, something to glamorous and out of reach. Regardless, it still has a special place for me. 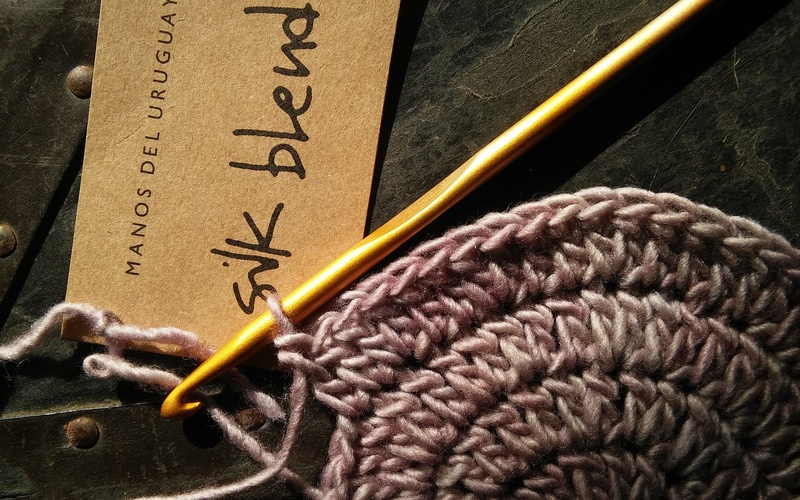 Manos del Uruguay has a nice yarn, Silk Blend, that the name alone attracts my attention. It is a single ply yarn that is made up of 70% merino extra fine and 30% silk. So merino extra fine, is essentially wool from the sheep breed Merino, and the extra fine notation indicated that the micron count is very high (micron count is the measurement of the diameter of individual fiber, the higher the number the smaller the micron count, the soft the fiber). 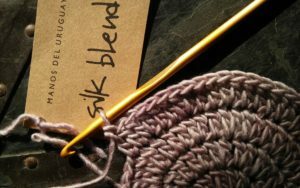 This yarn does live up to the label, it is soft, a real joy to use. The silk offers strength and a subtle sheen to the yarn. Silk is one of the strongest fibers available and like wool it holds warmth. Silk shares a lustrous quality that adds a warm radiance in the overall appearance, while using its strength to add integrity to this single ply. Even with the fibers being warm this yarn seems very breathable and I would be happy to work a light weight sweater in it. The single ply of this yarn does give me a bit of a pause. Even though it has great stitch definition, really allowing the stitches to shine, it has a bit of a halo. It does not readily pill, but I think that after continuous use, or multiple times being ripped back, that it may become a bit unruly and not nearly as fun to use. So keep the project simple, and one that you feel comfortable with the stitches, and you will only notice the fine qualities of this yarn. Each hank is 1.75oz/50grams, with a substantial 150yrd/135meters, easily making a beanie or fingerless mitts. I would feel comfortable with a few hanks to make up a nice scarf or wrap. This entry was posted in website, Yarn Play and tagged color, Crochet, dean, Design, designing vashti, drape, ideas, inspiration, linda, Linda Dean, linda dean crochet, manos del uruguay, Merino extra fine, shawl, silk, silk blend, single ply, skein, stitch, Stitches, twist, wool, Yarn, yarnplay by webmaster. Bookmark the permalink.